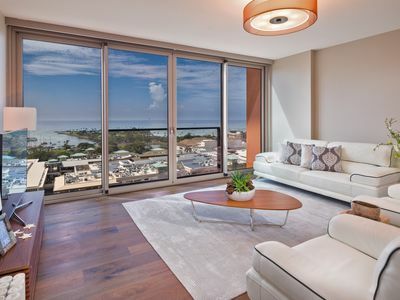 You’ll feel like you’re living in a big lighthouse at our 4-bedroom 3-bath home, thanks to its high ridgeline location and huge walls of glass overlooking the Honolulu skyline, the ocean, and Diamond Head’s commanding profile. 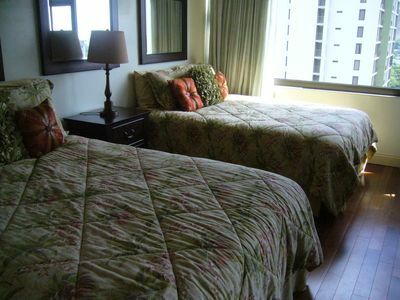 Our goal is to pass on the “aloha spirit” of Hawaii and make our home your home. We provide a full collection of indoor and outdoor items (less to lug during your travels!). 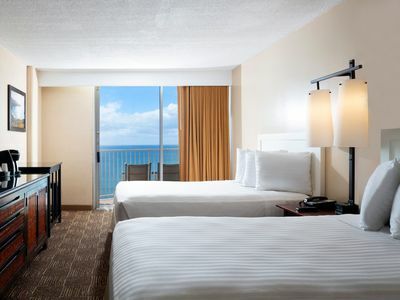 This includes outdoor gear like snorkeling equipment, surfboards, beach chairs and towels, golf clubs, and more. 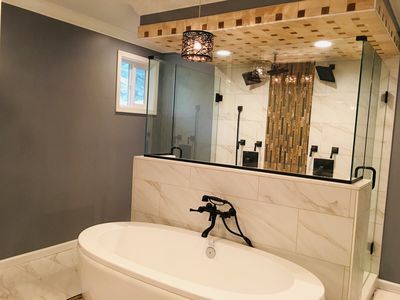 Inside, we stock the cabinets and shelves with everything from shampoos and lotions to spices and condiments to dish washing and laundry soaps. And for the keiki [kids], we stow away pack and play cribs, a baby swing, bouncer, Bumbo, nursing pillow, high chair, booster seat, umbrella strollers, jogging stroller, toys, games, and puzzles. When you arrive, a welcome basket will be waiting. For this “Aloha starter kit” we collect the finest Hawaiian goodies like Kona coffee, dark chocolate-covered macadamia nuts and fresh pineapple. 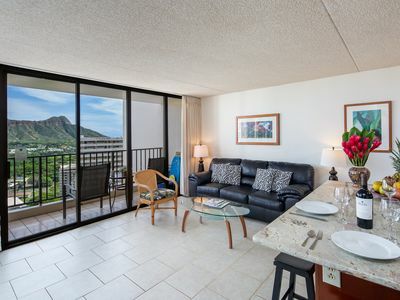 Nothing kicks off a Hawaiian vacation like a cup of Kona coffee and chocolate mac nuts enjoyed out on the lanai (balcony) with all of Honolulu spread out before you! 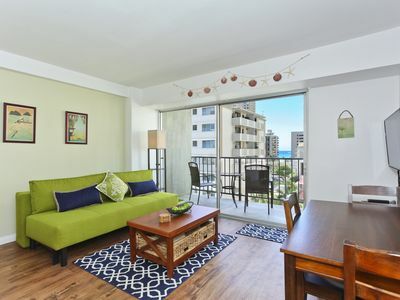 We live in the same lovely, residential neighborhood as Ocean View Waikiki and are available to answer questions, give suggestions, and take care of anything you need during your stay. 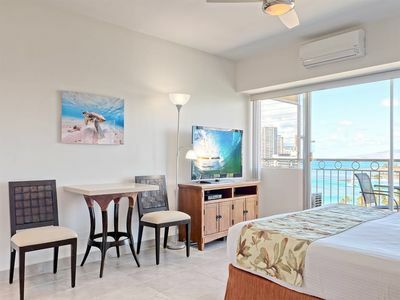 Ocean View Waikiki sleeps up to 10 people in 4 bedrooms and the living room with 1 king, 3 queen and 2 twin beds (that can combine to make another king). But if you have a larger group, please let us know! 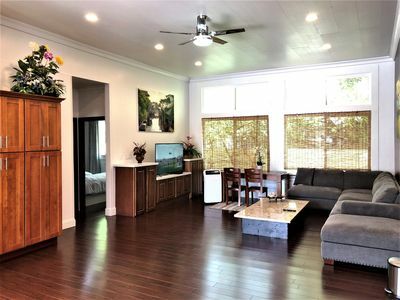 We can house up to 36 guests by combining this home with 3 of our nearby rentals, including the estate home next door, called Ocean View Diamond Head (sleeps 8), and a two-level home ½ mile away, with Ocean View Kahala on the lower level, which sleeps 10, and Ocean View Honolulu on the upper level, which sleeps 8. 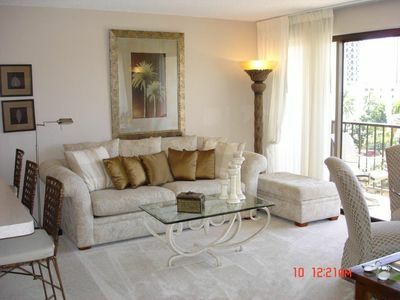 We’ve hosted many a large family reunion or wedding party using varied combinations of our rentals. 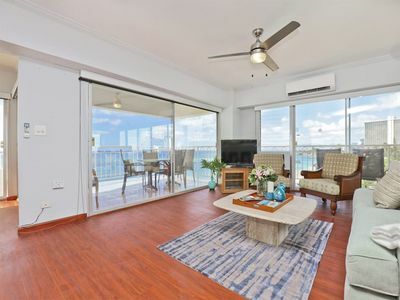 Save a bit of money by taking advantage of Ocean View Waikiki’s freshly remodeled kitchen, immaculate Weber grill on the lanai, and adjacent city-view dining table (seats up to 10 with plenty of room to spare). Enjoy each other’s company well into the night, as the city lights illuminate the sky. If you visit during a full moon, the scene will take your breath away! 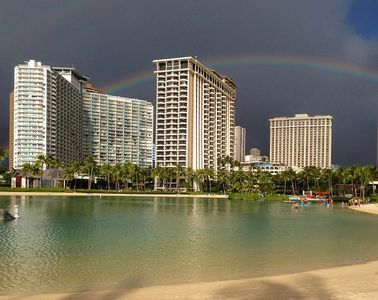 Rainbows stretching over the view are common, and so are fireworks popping over the city twice a week—sink into the seven-person hot tub for the island’s best front row seat! 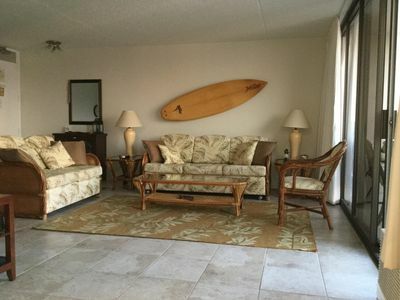 We didn’t skimp on modern technology, so you can keep plugged in for your vacation if you choose, including broadband and WiFi Internet, 4 big screen LCD TVs with DVD players (in the living room all 4 bedrooms), a wide selection of on-demand movies, telephone with free long distance, and a CD collection that’s yours to browse and use. 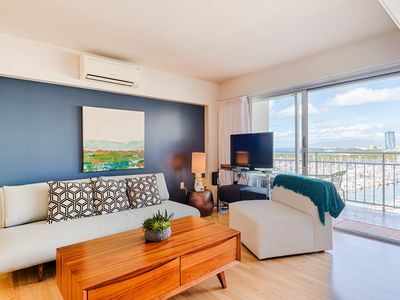 We make green living a priority, too, taking advantage of Hawaii’s plentiful sun with solar-heated water and solar panels to power the home. 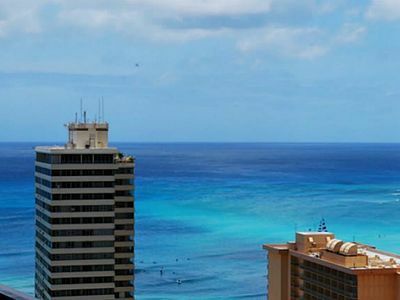 When it comes time to explore, we are close to many of Oahu’s attractions. 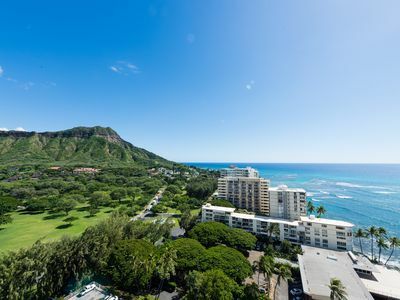 We’re 2 miles from Waikiki and Waikiki Beach, 2 miles from Diamond Head for the hikers in your group, 20 minutes from historic Pearl Harbor, and 45 minutes from the famous North Shore surfing beaches. Feel free to contact us with questions or booking information using the contact information above. 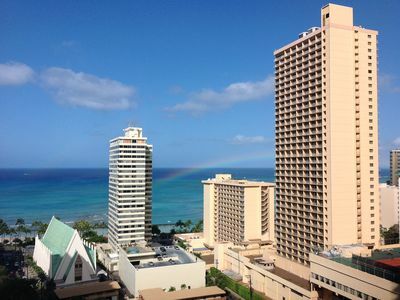 We hope to see you and your loved ones in Hawaii, and we encourage you to book soon—our calendar is quickly filling! 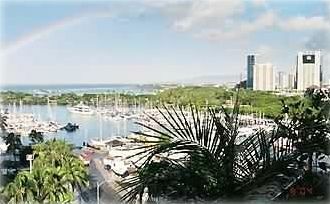 Waikiki Oceanfront Condo at the Ilikai - 30 Nights Min. 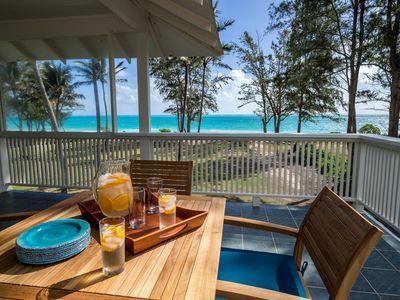 Beautiful Beachfront Beach House with Ocean Views from Every Room! 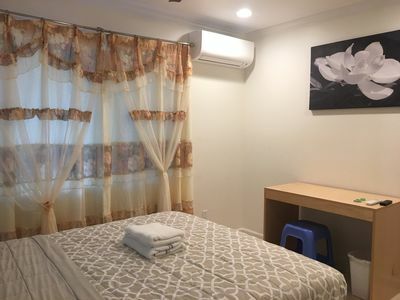 Last Minute Special Deal!! April, 2019! Max. 25% Off!!! Check it out!!! 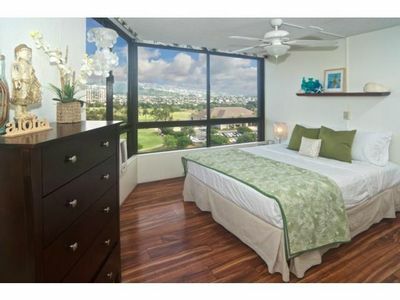 Ocean and City Views from this Comfortable Waikiki Condo & Free Parking!